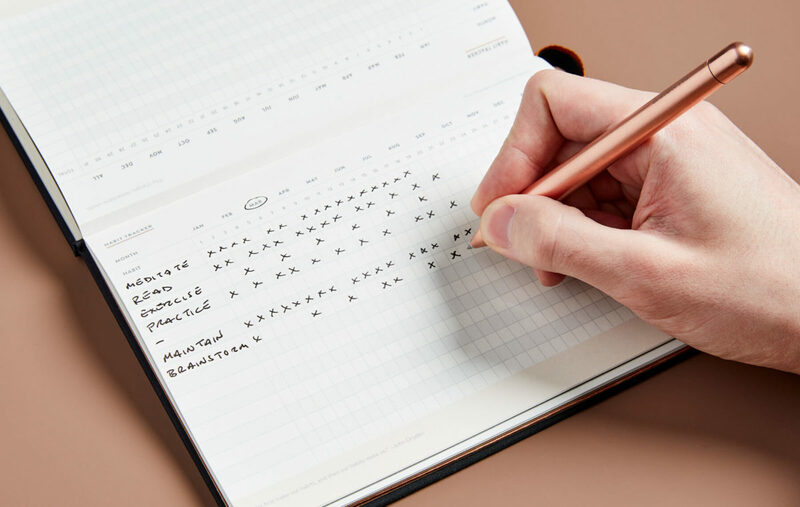 A combination daily journal, dot grid notebook, and habit tracker created in partnership with premium notebook-maker Baron Fig. Outside the United States? Click here to see what countries we ship to. What is a “Habit Journal”? 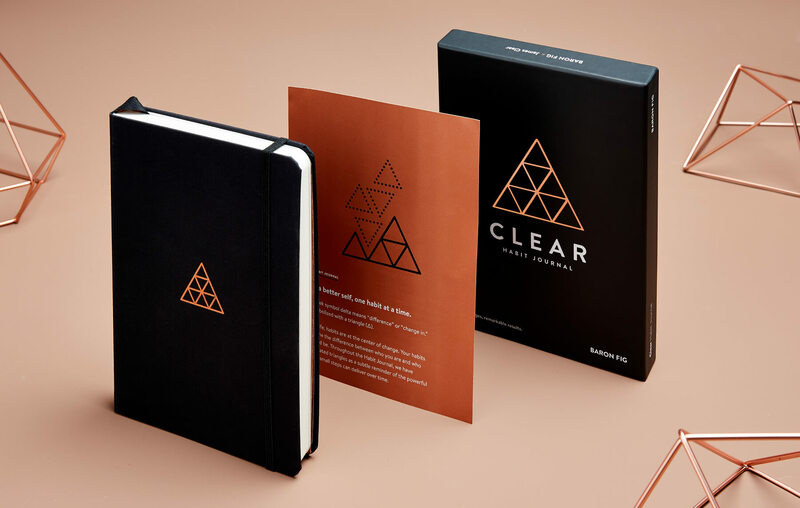 The Clear Habit Journal is a combination dot grid notebook, daily journal, and habit tracker. The design of the notebook came out of months of research that I did about what makes journals effective and what kinds of measurements and tracking are helpful for building habits. I’ve tried dozens of other notebooks and methods in the past. The habit journal is designed to resolve many of the common problems that plague other notebooks and journals on the market. 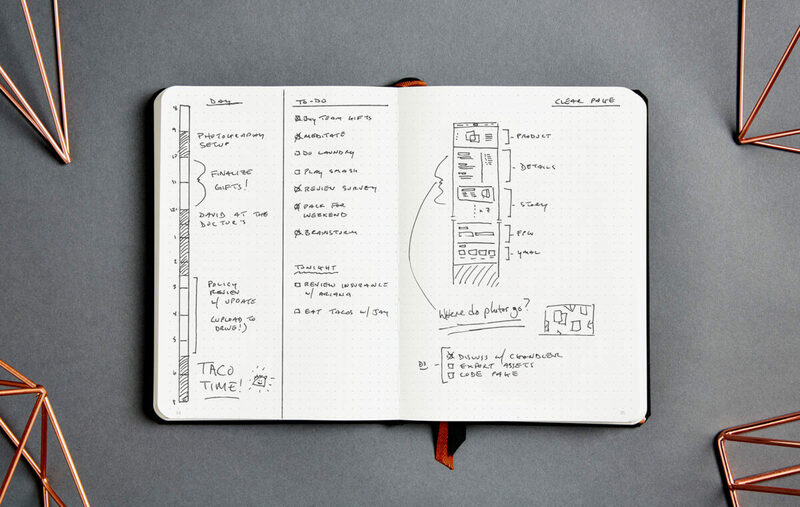 Most regular notebooks are too minimal. They leave it up to you to write page numbers, count dots, draw lines, and establish a structure on your own. And they certainly don’t give you a format or tracker for sticking with your habits. Meanwhile, most guided notebooks and productivity systems are too structured. They lock you into their format and give you no room for flexibility. You’re forced to answer specific questions or fit your answers into a confined amount of space. If you want to do anything outside the norm or make it your own, the notebook becomes useless. I was tired of choosing between no flexibility and unlimited flexibility. I needed a journal that gave me the white space I needed to think and the structure I needed to take action. I needed a multipurpose notebook that could allow me to plan out my days, track my habits, keep a gratitude journal, and brainstorm and sketch out new ideas for my business – all without lugging around four or five different notebooks. So, with the help of Baron Fig, I designed one. Baron Fig is a New York City-based firm that makes high-quality, premium notebooks. The materials, build-quality, and design they bring to the process are second-to-none. With their help, we created something truly fantastic. 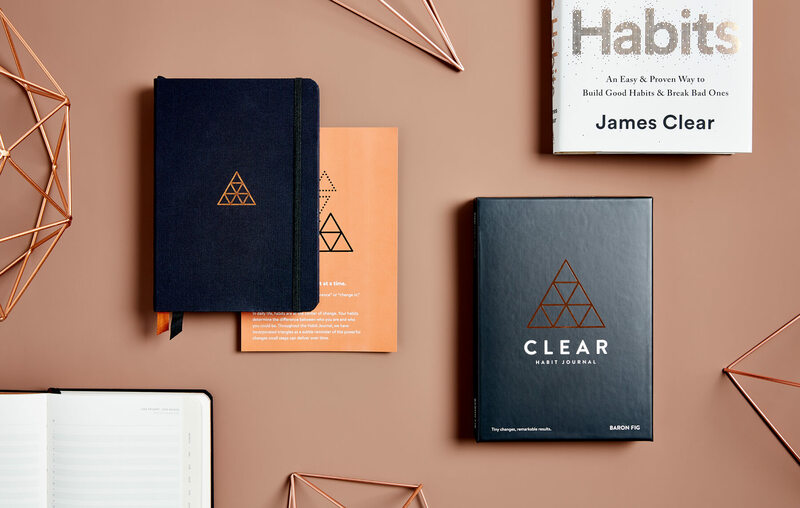 The Clear Habit Journal is designed to give you everything you need and nothing you don’t. Hardcover notebook that opens fully flat. There’s nothing worse than a book that curves so harshly in the center that 10% of the page is unusable. Problem: solved. Built-in index. A full index gives you two full spreads to log your content. Printed page numbers. Always know where you are and index your notebook in record time. You’ll never have to write your own page numbers again. 2 bookmarks. With multiple bookmarks, a ready-to-go Index, and clearly marked sections, it has never been easier to find the right page. 12 One Line Per Day journal pages. The One Line Per Day section makes it easy to build a daily journaling habit. Never feel you’re too busy to journal ever again. 12 perforated Habit Trackers. Each habit tracker template is perforated and can easily be torn out and hung on the fridge, placed on your desk, or anywhere else you choose. 168 dot grid pages. Pages feature exclusive “split grid” markings (ideal for bullet journaling). Quick start guide in the front. The first page of each journal contains a Quick Start Guide that explains how to use the various sections of the journal. 16 pages of examples in the back. These Habit Toolkits offer in-depth examples and layouts to help you be more productive, make better decisions, and get in shape. Quality, lasting paper. Acid-free fine grain paper allows you to use all sorts of mediums and archive your books safe from degradation. Inner pocket. Inside the back cover, you’ll find a pocket. Perfect for storing a ruler, Post-It Notes, stencils, or anything else. Signature “split grid” design. Creating your favorite page spreads has never been easier thanks to an upgraded dot grid design featuring subtle markings for dividing pages into halves and thirds. That’s just a quick look. Let’s dive into the details. The habit journal contains 224 pages in total. Let’s break down each section in detail. Quick start guide. Maybe you’re thinking, “This looks awesome and I think I want it… but I’m not quite sure how I would use it.” Have no fear. The first page of each journal contains a Quick Start Guide that explains how to use the various sections of the journal. Additionally, the back of each journal contains 16 pages of “toolkits” that have examples for how to use the various pages effectively. Log your content and easily build a daily journaling habit. Easy index. A full index gives you two full spreads to log your content. The built-in page numbers make it easy to reference each section and write down the appropriate location in the index. Underneath the prompt are 31 lines. One line for each day of the month. This is where you’ll write your one sentence each day. To start your journaling habit all you have to do is write your prompt for the month and jot down a few words each day. Once the month is complete, you can look back on 31 beautiful journal entries. The entire experience is designed to make journaling so easy that you can’t help but do it each day. Each habit tracker is perforated and can easily be torn out and hung on the fridge, placed on your desk, or displayed anywhere you choose. Habit Trackers. Each habit journal contains 12 habit trackers to keep you focused on your habits each month. You simply write down the habit you want to build and check it off each day you perform it. I’ve been shading in the boxes on my habit tracker, but you can also put an X, a dot, or a checkmark on each day. At the end of each row is a TOTAL column where you can add up your habits and compare them to the previous month. The habit tracker pages are perforated and can easily be torn out and hung on the fridge, placed on your desk, or displayed anywhere you choose. Create your favorite spreads with an upgraded dot grid that features subtle markings for dividing pages into halves and thirds. Split grid. The bulk of the notebook is made up of blank pages with our trademarked “split grid” design. The split grid pages can be used like any dot grid notebook page, but they come with a twist. There are subtle markings along the edge that mark 1/2 and 1/3 of the way down the page. These markings make it easy to create different page layouts without needing to count the number of dots. You can use the split grid pages for bullet journaling, logging workouts, keeping a decision journal, making a to-do list, or whatever else you want to write in your notebook. Toolkits offer in-depth examples and layouts to help you be more productive, make better decisions, and stay healthy. Exclusive toolkits. At the back of each journal, you’ll find 16 pages of “toolkits” that offer in-depth examples and ideas for getting the most out of your habit journal. This section includes (1) the habit tracker toolkit with templates on how to track your habits, (2) the decision making toolkit, which explains how to use the split grid to create a decision journal, (3) the productivity toolkits, which offer different layouts for organizing your day, and (4) the fitness toolkit, which shows you how to use the split grid pages as a workout journal. 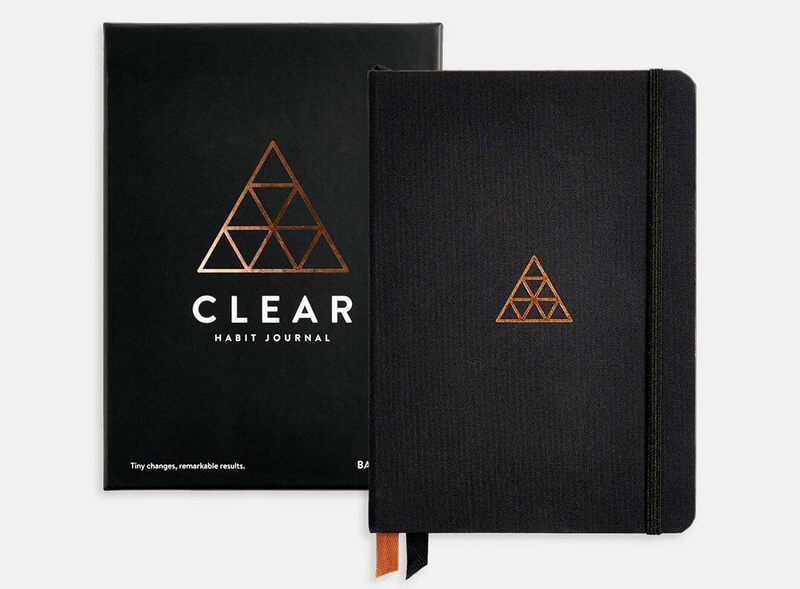 In short, the Clear Habit Journal will both keep you on track and make customization a breeze. You can do it all in one multipurpose journal. No need to carry multiple notebooks. No need to buy another notebook, journal, or planner again. 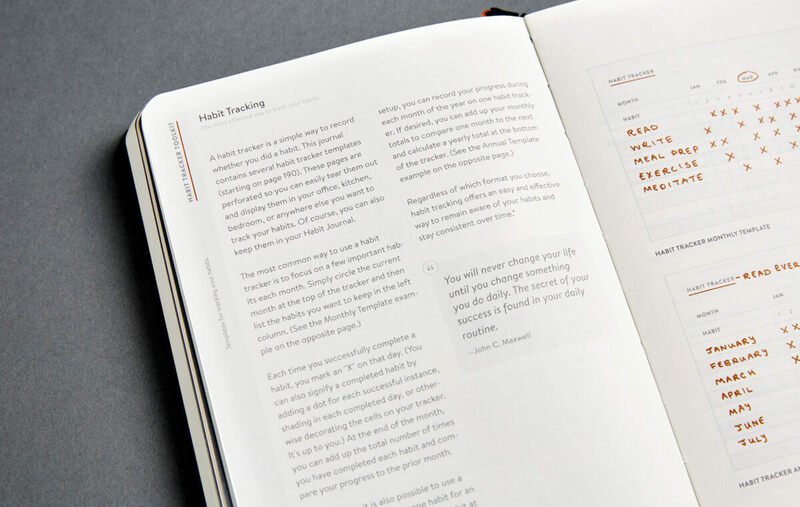 Readers outside the US can purchase the Habit Journal from our partner Baron Fig. 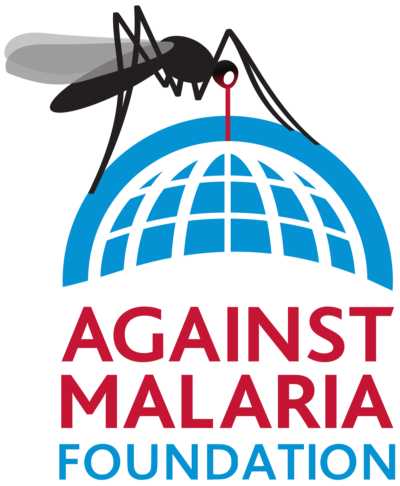 The US, Canada, UK, Australia, Andorra, Anguilla, Antigua and Barbuda, Argentina, Aruba, Austria, Bahamas, Bahrain, Barbados, Belarus, Belgium, Belize, Bermuda, Bolivia, Brazil, British Virgin Islands, Brunei, Bulgaria, Cayman Islands, Chile, Colombia, Costa Rica, Croatia, Czech Republic, Denmark, Dominican Republic, Ecuador, Fiji, Finland, France, Germany, Greece, Greenland, Holy See (Vatican City State), Hong Kong, Hungary, Iceland, Indonesia, Ireland, Israel, Italy, Jamaica, Japan, Korea, Latvia, Liechtenstein, Lithuania, Luxembourg, Macao, Macedonia, Madagascar, Malaysia, Maldives, Malta, Mauritius, Mexico, Monaco, Morocco, Myanmar, Nepal, Netherlands, New Zealand, Norway, Panama, Papua New Guinea, Paraguay, Peru, Philippines, Poland, Portugal, Romania, Russia, Saint Lucia, Singapore, Slovakia, Slovenia, South Africa, South Korea, Spain, Sweden, Switzerland, Taiwan, Thailand, Turkey, Ukraine, Uruguay, Venezuela, Vietnam, and Western Sahara.